“Life Should Be Simple and Easy: If You’re Doing It Hard, You’re Doing It Wrong,” by Conrad Aquino, MD and Bryson Miller is a short and to-the-point workbook, the goal of which is to guide readers to a better, simpler way to see the true meaning of the big concepts of human life to achieve a happier and simpler way to live. The process described within this workbook is based on the process applied by the authors to reach their goal of eliminating a stressful life and re-discovering life under a new point of view. The book is formatted by expressing a statement, developing their point of view through argument and examples, followed by a summary and exercises. Instead of Chapters, the reader will find that the book is split into weeks. The purpose of this is to have readers take their time with each concept by reflecting on it before moving on to the next one. At the end of each week there is a space provided for notes. I find the authors intent is to genuinely share what made their life better. 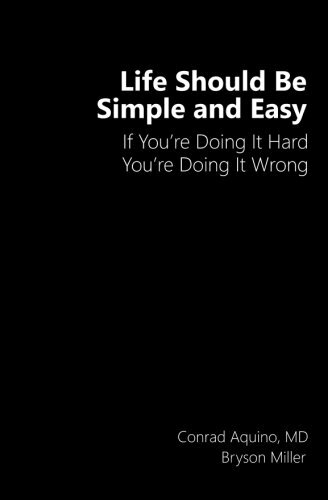 However, I must say I agree with them that, “Life Should Be Simple And Easy” is not a read for everyone. This book is for an open-minded audience willing to listen to a unique point of view. In my own experience I found this book described many of my own views, and although raised Catholic, I did not find anything within the authors’ argument offensive. This might not be the same for others, yet I believe some might find this little workbook useful to begin looking to change their life for the better if they are open enough to go beyond their belief structure, if only to listen and apply only the concepts that work for them. Overall, I found “Life Should Be Simple And Easy” by Conrad Aquino, MD and Bryson Miller re-affirming to my choice to live under my own lens and not what others think I should do. I would recommend this book for any open-minded person who has reached a point of realization that their way of life is not working for them; as a place to begin their journey.